Annaprasana is a traditional ceremony in India for babies. When the child is between six and seven months old, first solid food feeding is celebrated as a big event. It is not usually performed before the child is four months old because the baby will not be able to digest the solid food. 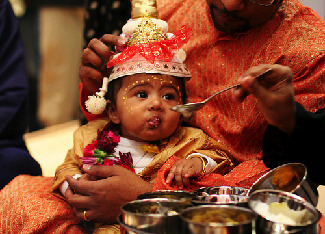 Also it is advised that the ceremony should be performed before the child is one year old because delaying it will affect child's nutrition and it will in turn will affect the child's mental and physical growth and brain development. The type of food are defined by the scriptures. The advice is that food of all kinds and of different sorts of flavors should be mixed together and given to the child to eat. Some suggests that a mixture of curd, honey and ghee can be a good combination. Meat is also fed sometimes. Earlier days child's father used to feed bird's meat Bharadvaja, if he wished to the child fluency of speech, with flesh of Kapinjala and ghee if abundance of nourishment, with fish if swiftness, with the flesh of the bird Krkasa or rice mixed with honey if long life, with the flesh of the bird Ati and partidge if he desired holy lustre, with ghee. and rice if brilliance, with curd and rice if strong senses, and with all if he desired every thing for the child. More recently, the trend is vegetarian food. It was due to the cults of non violence which influenced the Hindu diet to a great extent. But animal products like curd, ghee and milk were still retained and regarded as the choicest articles of food for the child. The Markandeya purana recommends a mess of milk and rice with honey and ghee. The popular practice that at last became current was of giving milk and rice. Books on ritual, however, still insist on animal food. Family members can prepare songs to sing about ganesh during the function. Also there can be friends, family and relatives invited for this function. You can also invite for Annaprasana using e-invitation.